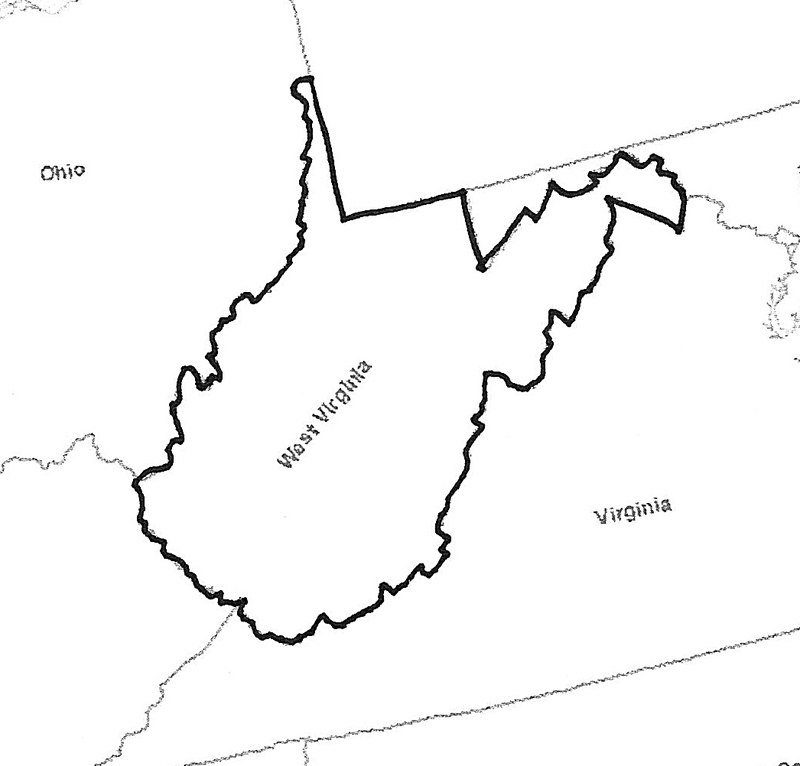 How did West Virginia get that goofy shape? Is it possible that someone intentionally created a state that looks like this? Not exactly. West Virginia was “spun off” from Virginia when residents on both sides of the Appalachian Mountains acknowledged that they had little in common with each other and that transportation between the two regions was extremely difficult. Keep in mind that land transportation at this time was primarily horse and buggy, and a mountain range was a huge impediment to travel. And there was a disparity in the availability of standard government protection and services. The people in the area that is now West Virginia did not feel that they were represented by the legislature to the east and so they voted to secede from Virginia at the same time that Virginia seceded from the Union at the onset of the Civil War. The boundary was essentially defined by the meandering lines of the Appalachians, but was also partially influenced by Congress’ interest in making West Virginia a viable state. Unlike the Virginia side of the Appalachians, West Virginia had poor land and fewer natural resources. 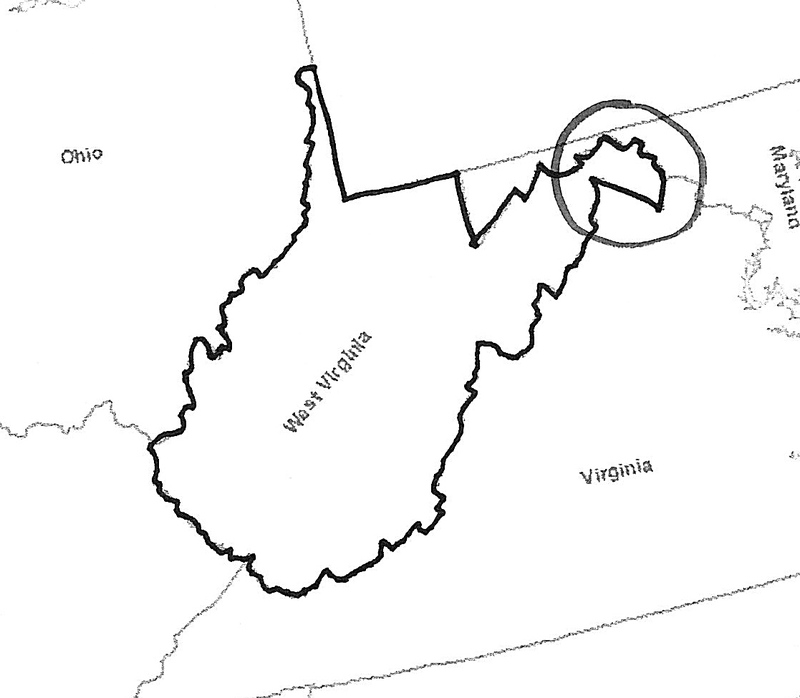 The odd drop down notch at the northeast corner of the border between Virginia and West Virginia (circled on the map below) was added to West Virginia’s territory by Congress because it was fertile and would provide a means for West Virginia to become self sustaining. Virginia argued vehemently to keep that land, but having recently seceded from the Union, Virginia had very little bargaining power with the U.S. Congress. That little finger of West Virginia that snakes up the side of the Pennsylvania border was left over from an earlier dispute that Virginia and Pennsylvania had over the place where the Monongahela and Allegheny Rivers met. Both territories laid claim to that land and when Congress awarded it to Pennsylvania (who called the new city there “Pittsburgh”) Virginia was compensated with a swatch of land to the west. When West Virginia was created, that land became part of the new state. This entry was posted in Uncategorized and tagged civil war, Pittsburgh, Virginia, West Virginia. Bookmark the permalink. I grew up in NE Ohio, and West Virginia was that odd state south of us that we went to once on a school field trip. It was a different land – and sounds like it’s been considered that for a long time. I had no idea it had so many nooks and crannies. I now know why! Also fun to read Monongahela, which being raised in NE Ohio, close to PA, is one of many Native American names that we grew up with. Brings back good memories to hear it again. Actually, I’ve frequently wondered about the jagged shape of West Virginia and now I know the answer. Thanks for a great blog–I’m learning so much that I never knew! That notch also covers the Federal Arsenal at Harper’s Ferry, which Congress also didn’t mind taking out of the Rebel state of Virginia. Yep Cat. There were also issues about the way slaves were counted that impacted West Virginia’s decision to break off of Virginia. Lots of politics and cultural things all wrapped up in this “little” event.